1. It is important to do all of your assigned readings. In a perfect world you would have the time and energy to read everything mentioned on your syllabus, but this generally isn’t possible. Though you are in school to learn, and doing your readings is an important part of that, sometimes there just isn’t enough time in the day to get everything done. If you have to make choices about what to read, generally speaking the most important readings will be mentioned numerous times on your syllabus or will be highlighted in lectures. Some of your readings will also relate more to your assignments and are therefore more valuable. For other readings, you may just need to skim, or skip them altogether, but favoured readings should be read carefully. For more thoughts on this topic check out this College Info Geek video. 2. It is important to consider why you are doing the reading. While you obviously do your readings because they were assigned to you and you want to do well in school, what you will be expected to do with the knowledge you acquire from the text should impact how you interact with the content. Are you going to be assessed with a multiple choice quiz? Will you have to write an essay or give a presentation? Likely you will have to do more than just regurgitate facts, so consider this when reading. However, if you need to memorize something verbatim such as a definition, that is different than teaching a concept in depth with a project. For more reading tips check out the Dartmouth website on reading textbooks. All of these strategies are an important part of reading effectively for school, but taking notes while reading helps to build connections between concepts and will make studying for tests later much easier. Taking notes can mean writing in the margins of the text itself, making a mindmap or writing out major concepts on a loose-leaf piece of paper. A good key is to make sure that you don’t write more than one page of notes for each chapter, otherwise it is unlikely you will revisit them. It is also important to put content into your own words and to write out any questions so that you are reading actively . While all of these strategies are an important part of reading effectively for school, reading often will help to improve your reading strategies and make reading more of a habit than a chore. However, when reading it is important to be an active reader . While all of these strategies are an important part of reading effectively for school, it is important to remember to reward yourself for your hard work. While good grades are an excellent motivator for many people, this reward isn’t very immediate. It is good to give yourself something that day or that week for the hard work you have put into studying and actively reading such as an episode of your favourite TV show, or a fun activity. Making sure you have a work-life balance is an important part of being a student. 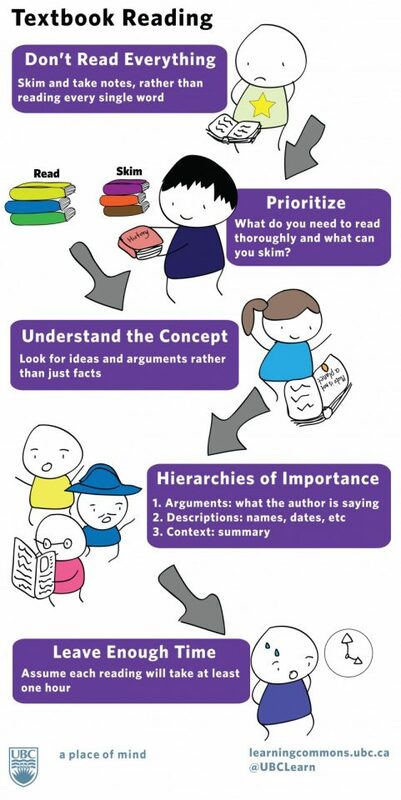 While all of these strategies are an important part of reading effectively for school, sometimes reading the summary of an article or a textbook chapter first will help to focus your attention and allow you to understand a concept more generally before delving into specifics. More often than not textbooks do not have a narrative, so reading a chapter out of order will not spoil the ending and can be a good reading strategy. More reading tips can be found here. While bolded terms are often important concepts or terms that need to be understood, you should not just focus these parts in isolation as this will mean that you are not actively engaging with the content. It is important to understand the term in a broader context, and knowing how it can be applied, not just what it means. Reading actively is an important part of reading textbooks well that requires more than just memorizing terms. Remember: It is important to read when your energy and concentration levels are at their highest. For more tips check out Ohio University's Concentration Study Tips. been discussed for a long time. Wonderful stuff, just great! Tell us what you think of the Reading Textbook Toolkit. Please select a response.